Toyota's image has been damaged by confusing advice to customers, crisis communication experts say. Toyota is on the verge of "capitulation to irrelevance or death". Not my words, but those of Toyota president Akio Toyoda. He said it, not in response to the continuing recalls of more than eight million cars worldwide, but in a speech at the Japan National Press Club on 2 October 2009. At the time, long before the latest safety scares, a slew of quality and safety problems had sent Toyota's reputation sliding. The decline was there for all to see. It was written into the company's sales and earnings reports, which revealed months of steady decline. Selling more cars than General Motors (GM) and thus becoming the world's biggest carmaker had never formally been a target for the Japanese carmaker. But volume growth had: in 2002, when the company's global market share stood at little more than 10%, then Toyota president Fujio Cho outlined a plan to reach 15% soon after 2010. A year ago, when GM stumbled towards bankruptcy, Toyota's ascent into the top slot was inevitable. 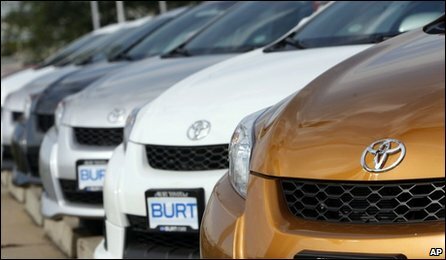 In 2008, Toyota sold 8.9 million, while GM sold 8.3 million vehicles. But the rot had already set in; Toyota had just issued its first-ever profit warning for the year as a whole. Then, in spring 2009, it reported a 436.9bn yen ($4.4bn; £2.9bn at the time) operating loss for the fiscal year to March. The company was in crisis mode. In June, Mr Toyoda stepped in at the helm of the huge carmaker, four months after former Toyota president Katsuaki Watanabe was ousted in a humiliating ritual in front of some 400 Toyota executives. Akio Toyoda was clear in his criticism: the executives running the company that his grandfather Sakichi Toyoda founded had run it into the ditch. 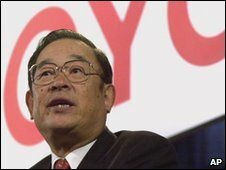 "Toyota has become too big and distant from its customers," he said in his autumn speech, castigating the firm's executives for their "undisciplined pursuit of more" and for their arrogance, which he referred to as "hubris born of success". Within weeks of taking charge, Mr Toyoda was informed of an accident in which an off-duty traffic officer and three of his relatives had died. The accelerator getting caught in the floor mat of the brand-new Lexus was deemed a possible cause. "Four precious lives have been lost," Mr Toyoda said at the time. "I offer my deepest condolences." A recall of 3.8 million Toyotas followed, involving a so-called "semi-permanent floormat installation process" - or rip-zipping the driver's side mat to the seat rails. The current pedal problem, which has led to the latest recall, is more complex and the fix is proving considerably more costly. Toyota estimates its losses will reach $2bn (£1.23bn) in costs and lost sales from its worldwide recall of vehicles that might have faulty gas pedals, although this figure does not include other potential problems - for instance, reported issues with the brakes on the carmaker's Prius model. But the losses could escalate if it turns out that the trust and reputation the company built up over a period of decades has been demolished almost overnight. Crisis communication consultant John Huntley, managing director of John Huntley Training, says such concerns are well founded. "Something has gone wrong and it seems people may have died," he points out. "I think it's going to take Toyota years to get out of this one." To Mr Huntley, there is no doubt: Toyota had to face the music, as failure to do so could have been even more disastrous. And for what they are worth, Toyota's apologies have been a useful first step in terms of alleviating the situation. But acknowledging that something has gone wrong is not in itself enough, Mr Huntley points out. "People want to know what they're going to do about it, and at this stage it's a complete dog's breakfast. There's just too much conflicting advice out there," he says. Mr Huntley is particularly critical about advice that says only customers who "experience any issues with their accelerator pedal" should contact their dealership, pointing out that any advice that relies on customers' own judgement about whether or not their actions are safe is flawed. Ong Hock Chuan, from crisis management firm Maverick in Jakarta, agrees. "In moments of a business crisis, people want to see [the head of] a company take full responsibility, be empathic to the victims and their families and be in control by outlining the problem and how they intend to solve it," he says. "Toyota seems to have failed on all counts. Its admission of the problem has been half-hearted and almost reluctant, it has failed to apologise unequivocally to victims and their families, and it's failed to articulate and communicate what it intends to do to regain control of the situation." Spooked investors have been keeping a close eye on the situation. Many are already taking flight, as can be seen by sharp falls in the share price. "There are simply too many uncertainties surrounding Toyota at the moment," says Kazutaka Oshima, chief executive of Rakuten Investment Management in Tokyo. Benedicte Mougeot, fund manager at HSBC GIF Japanese Equity Fund in Hong Kong, is also concerned. "Taking into account the increased risk and reduced profitability, we will review our investment." Risk-averse investors fear car buyers will also shy away from risk too. 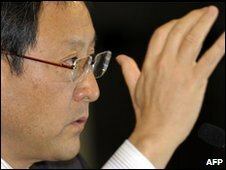 "We are not certain about how Toyota's damaged reputation will affect its earnings in the future," says Mr Oshima. "The best thing to do now is not to hold Toyota shares."